As pressures grow on schools to address students’ physical and mental health, including the stress and trauma they may experience in their homes and neighborhoods, many California educators are acknowledging that they don’t have the resources they need to respond appropriately. As they face this reality, school districts are increasingly willing to embrace a range of strategies to offer these services to their students because they see them as crucial to a student’s ability to succeed academically. California now ranks 39th nationwide in its school nurse-to-student ratio and its ratio of counselors to students is last, according to research by Columbia University economics professor Randall Reback that was published as part of the Getting Down to Facts II report series released in September. Reback found that less than half of California’s public-school students have regular access to physical health care — such as a full-time school nurse or an on-site health clinic — in their schools, and less than half of California’s elementary school students have access to mental health care in their schools. One reason for the limited access is California does not require districts to spend a minimum amount on school-based health and mental health care, like some states do. Delaware, for example, passed a law in 2016 requiring that every public secondary school have a school-based health center. New Jersey has a law mandating that every district have a full-time school nurse and the Legislature passed a resolution in 2006 calling for a nurse for every 750 students. As a result, in both of those states more than 98 percent of high schools employ a full-time registered nurse, according to a survey by the Centers for Disease Control and Prevention. In California, meanwhile, less than 25 percent have a full-time nurse. Yet any sort of statewide requirement is unlikely in California, especially considering that the Local Control Funding Formula, outgoing Gov. Jerry Brown’s signature education reform, is focused on imposing fewer state mandates on local school districts, not more, said Brad Strong, senior director for education policy for Children Now, an Oakland-based advocacy organization. Even if enticing incentives for increased spending were offered in place of mandates, many districts would probably pass on the opportunity, say Strong and others who study education budgets. That is because despite today’s booming economy, a number of them are facing huge long-term deficits. The deficit in Los Angeles Unified, the state’s largest school district, is expected to reach $400 million by the 2020-21 school year. That will deplete its reserves and render the district insolvent, according to a task force studying the district’s finances. Oakland Unified has determined it must make up to $30 million in ongoing cuts to avoid being taken over by the state for the second time in 20 years, according to district estimates. So districts must find other approaches and other sources of funds if they want to improve the health of their students. One option is for them to collaborate with county governments and nonprofits to take advantage of federal funding earmarked for children’s health, which mainly comes in the form of Medicaid (in California it is called Medi-Cal) dollars. Yet this is another area where California lags. The state ranks 43rd nationwide in Medicaid spending per student on school-based health and mental health services, according to Reback’s research. But there are places where collaborations are thriving and, perhaps not coincidentally, some of the most innovative efforts involve districts with large numbers of high-need students and the worst budget outlooks. Oakland Unified benefits from the Alameda County Center for Healthy Schools and Communities, a county agency that supports 16 school-based health centers, which serve all the district’s high schools and a majority of its middle schools. The agency is funded through Medi-Cal money, local sales tax revenues, private donors and part of the county’s share of the 1998 master tobacco settlement that requires cigarette manufacturers to make annual payments to states. 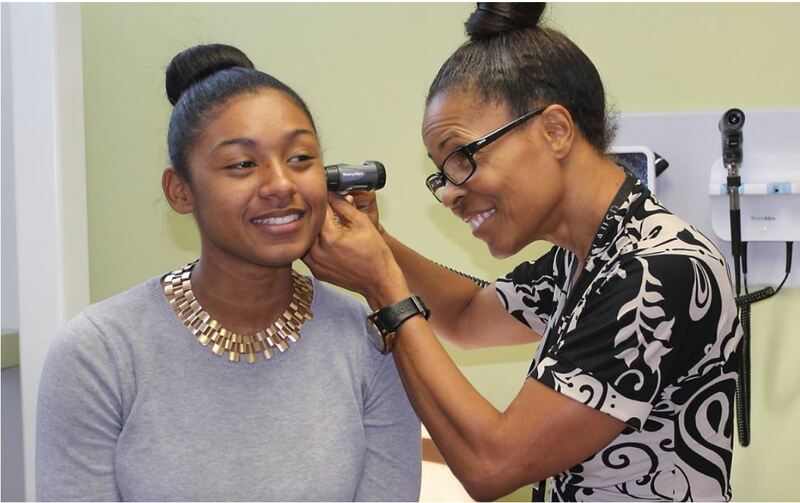 In Los Angeles, the L.A. Trust, a nonprofit established by the district in the 1990s with a grant from the Robert Wood Johnson Foundation, has expanded in recent years to support 15 full-service health centers in L.A. Unified schools and fund student-run health prevention and education programs. Since 2011, the organization has raised $14 million through foundations, government contracts and private donors. San Diego Unified, the state’s second-largest district next to L.A. Unified, has a mental health resource center with a staff of 180. The center provides services for special education students throughout the district and partners with San Diego County and 14 area nonprofits to provide mental health services for all students at more than 100 schools. As Reback pointed out in his Getting Down to Facts report, California schools are responsible for providing mental health services to special education students who have Individualized Education Programs calling for those services. But the responsibility for providing mental health services to all other children falls on county behavioral health departments. In particular, health departments are required to provide what the federal government calls Early and Periodic Screening, Diagnosis and Treatment (EPSDT) to all Medi-Cal eligible children, regardless of whether they have an Individualized Education Program. The covered services range from dental check-ups to eye tests and mental health screenings. However, as Reback found, even though counties receive money each year from the state to provide these services, they are not compelled to collaborate with school districts. As a result, few county health departments have working relationships with school districts. One of the reasons why Alameda County is an exception is school and county officials have worked together to create school-based teams that include school administrators, county social workers and after-school providers who direct services to students. In 1999, the federal government — responding to the massacre that year at Columbine High School in Colorado and several other high-profile school shootings during the late 1990s — established the Safe Schools/Healthy Students grant program. The purpose of the multi-year, multi-million-dollar grants was to provide districts with seed money to establish mental health programs that would ultimately be self-sustaining. Unfortunately, many were ended during the Great Recession. But San Diego Unified’s program, called the Mental Health Resource Center, continues to thrive to this day. A big reason why is the district’s decision in 2001 to tap Shirley Culver, who had worked for the county behavioral health department, to run the program, said Aidee Angulo, program manager for the center. Culver, who has since left the district, was not only able to navigate the county bureaucracy, but also had a deep understanding of its contracting process. As a result, the resource center has, over the years, secured eight county behavioral health contracts to provide mental health services throughout the district. There are a number of reasons — ranging from unreliable transportation, parent work schedules to fear of stigma — that keep children from getting the health and mental health care they need in their communities. Having health centers on school campuses, or having therapists visit school sites, goes a long way toward removing these barriers to access, say the officials interviewed by EdSource. In Los Angeles Unified schools, L.A. Trust has established student advisory boards that help with awareness campaigns on issues like substance abuse and pregnancy prevention. L.A. Trust also works with promotores, who are lay people in Latino communities trained to provide health education. Puffer said making a difference requires making such connections. “When you have a large and complicated state, you have to be very creative about how this happens and whom you partner with,” she said.